Want to try VR but don't want to break the bank? Look no further. With the new Daydream View, you get a comfortable fit, sleek-looking headset, and access to all the immersive Daydream VR apps in the Google Play Store. But you need a compatible Android phone, and you may get bored after a bit. Mobile VR is the most affordable way to experience virtual reality. You can go ultra cheap with the £15 Google Cardboard headset, which works with most iOS and Android phones, or you can spend a little more on the £80 Samsung Gear VR, which works with a select-few Galaxy phones. Then, there's the first Daydream View (£99) that works with Daydream-ready Android phones, including the new Pixels. Experience-wise, it's actually a compelling mobile VR headset. We described it in our review last year as the easiest to put on and most comfortable VR experience we've used, bar none. Flash forward to now, and Google has updated Daydream View. And we've been playing with it for the past week to find out what's changed from last year's model, why it costs more this time around, and whether it's the best virtual reality headset, in terms of mobile VR, anyway. What smartphones are compatible with Daydream View (2017)? So, it's been a while since Google introduced Cardboard, then followed that up with Daydream, and competitors like Gear VR have popped up along the way, and yet, you still don't see many people at the airport or some other public place wearing a mobile VR headset. Why is that? They're fairly inexpensive, after all. Maybe it's because these headsets require a compatible phone for power and a display. The new Daydream View works with any Google Pixel or Daydream-ready phone. Currently, that's only 12 Android phones: the Moto Z, Moto Z2, Huawei Mate 9 Pro, ZTE Axon 7, Asus ZenFone AR, Samsung Galaxy Note 8, Galaxy S8, Galaxy S8 Plus, Google Pixel, Pixel XL, Pixel 2, and Pixel 2 XL. Now, these phones are mostly the same on the inside, but their displays differ, and that's important to note. For instance, the Pixel 2 XL has a 6-inch (2,880 × 1,440) display, while the Pixel 2 has a 5-inch (1,920 × 1,080) display. The Pixel 2 XL therefore has a higher resolution, larger display and offers a sharper image and a larger field of view when used specifically for mobile VR. So, yes, the Pixel 2 can be used for Daydream VR, but the image clarity and field of view just won't be as great as the Pixel 2 XL. Go here to learn more about Google's Daydream mobile VR platform. How does Daydream View (2017) differ from Daydream View (2016)? This year's Daydream View looks a lot like last year's Daydream View, but it's actually very different both on the inside and outside. The new headset has a redesigned face pad and straps, resulting in more evenly distributed weight and pressure on the face. There's a better seal, too, so there's less light leaking around the nose, and there's an optional, detachable top strap that adds more stability. The top strap will also take some weight off your face, and thanks to the foam on that new face pad, we were able to use the newer headset on a longer basis. Google also added a magnesium heatsink to the lid, which allows your Daydream-ready phone to run VR longer without overheating or dialing back on performance. But the most significant difference comes down to the new, larger lenses. They've moved to a fresnel design and are designed to offer a 10-degree wider field of view, and, as Google put it, a "larger sweet spot" so that it's easier to get and keep VR images in focus. We agree that the custom fresnel lenses allow you to more easily find and maintain a sharp view, and we think these improvements will help the new Daydream View (2017) to better compete with the Gear VR. Aside from the improved straps and optics, the new Daydream View also has new materials. Google ditched the smooth jersey in favour of a more textured fabric that you can get in three new colours: Charcoal, Fog, and Coral. Overall, we think Daydream View feels more polished and sturdy than before. And we like that you can still pull out the facial interface in order to wash it by hand or machine. 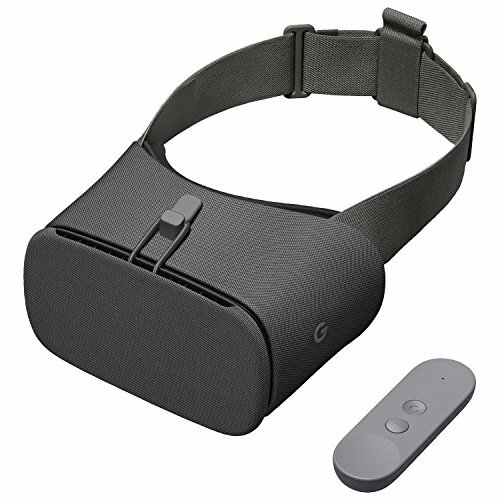 Also, in the original Daydream View, all the plastic bits of the headset were beige or gray - no matter what colour fabric you chose. Now, if you buy the coral one, you’ll get coral plastic parts and even a coral controller. Unbox the new Daydream View, then remove the blue lens film from it, and insert your Wi-Fi-connected, Daydream-ready phone into the tray of the headset (just like you would on the old Daydream view). The Daydream app should open automatically, or you'll be prompted to install the app and go through the setup process, which involves signing into your Google account and finding VR apps. After setup​ ​is complete, you can put​ ​the​ ​phone​ ​in​ ​the​ ​headset​, with the screen toward the lenses and the volume buttons facing the latch, and then close the latch. Finally, put the headset on so that the head strap sits right above your ears. To tighten and adjust the headset, grab both clips on the head strap and slide them apart. The face pad should sit tightly, but comfortably, on your cheeks. Your view should also be in focus and sharp. You can use the top strap for an even more secure fit. To adjust the top strap, slide the clip forward and backward until it fits firmly. Now, Google recommended using Daydream View while you’re seated, on a swivel chair, for a full 360 experience. Once you've done all that, and have the controller in hand, go through ​the​ ​“Welcome”​ ​experience. We received the new Daydream View pre-launch, with a Google backdoor to access new Daydream apps, so your experience may differ slightly to ours. But that shouldn't be an issue, as View is a total doddle to setup. The embedded NFC chip will make the phone automatically switch into the Daydream interface (with half the screen designated per eye), and the image automatically aligns itself. Things should be in focus from the get go, which is something you certainly don't get with Cardboard. What can the new controller do? When you enter Daydream Home, you can use the controller, which charges via USB C, to browse through featured content and find your recent apps. You'll also be able access to the Google Play Store. If there are any problems with calibration during use, then the controller's Home button ("O") can be pressed and held to reposition the centre view. A quick, simple, and sensible solution. To scroll around, swipe from left to right on the area above the "-" button on the controller. You can also press this touchpad-like area whenever you want to select an app or select an option within an app, obviously. To return to Daydream Home at any time, just press the Home button on the controller. Google said it revised the controller so it has more clearly defined, easier-to-find buttons. The only other buttons you'll find on the new controller are on the right side; the volume rocker. Lastly, to stow the new controller away, clip it to the fabric loop on the rear strap, rather than tuck it inside the front panel, like you had to on the old Daydream View. In our experience, this means you can access it more quickly. Google also said it improved this controller's software, making it more accurate. But this update will come to original Daydream controller, too. The Daydream View app hasn't changed too much. For instance, when you open it, without slotting it into the Daydream View, you'll see featured apps and recommendations. It's like the hub of Google VR. There's a Discovery screen of suggested apps in the Play Store, your library of Daydream-compatible apps installed on your phone, and Settings to configure your notifications, and more. It's a neat and tidy access point into VR content, much like the Google Cast app serves to manage all your Cast devices in the one place. We like it. We were able to find and play with several cool experiences, including Netflix VR, which makes it seem like you're sitting in a theatre while viewing a film or TV show, and Keep Talking and Nobody Explodes, which you can actually play with a friend. What can I play on Daydream View? Daydream is more mature now, so there are handful more experiences worth checking out. Including the ones we mentioned earlier, we also really like Warner Bros' Fantastic Beasts, which allows you to step foot in a wizarding world. We've also played Hunter's Gate, which is a third-person shoot-em-up, and the cutesy 3D puzzler Mekorama VR. There are plenty of apps to keep you busy and excited. For instance, when we got our test unit, Google recommended we try Eclipse: Edge of Light, Virtual Virtual Reality, So Let Us Melt, Toy Clash, NextVR, The Guardian, Asteroids, and Gunship Battle 2. Over time, however, we suspect you're going to need a bit more in order to feel compelled enough to put your phone into the Daydream interface and then sit closed off in a headset for hours at a time. Aside from the physical and spec changes to the headset, this is pretty much the same Daydream. The software experience hasn't really changed, though, thanks to the heat sink, you should get a more consistent performance. This year's Daydream View is a definite upgrade over last year's, and the $20 price increase is still relatively affordable. If you already own a compatible phone, it's the best mobile VR headset to try. Because, honestly, that price increase gets you new material and colours, an extra top strap, custom fresnel lenses, 10-degree wider field of view, revised controller, and a lid that doubles as a heatsink. The virtual reality content you can find and play on this headset is the same across all Daydream headsets. It's immersive enough, and it gives you a taste of the potential of VR without breaking the bank. However, the biggest setback here is a lack of iOS support. Also, with wireless, fully tracked headsets on the way from Oculus and others, mobile VR is feeling cheaper than ever (and not in good way). Daydream View is like a souped-up, comfy Cardboard. Yes, it’s accessible and easy to use, but admittedly, you may become bored with it after a few weeks and ultimately wonder what kind of tricks the higher-end headsets offer. But that's consumerism at its worst, right? Samsung's new Gear VR headset, unveiled at Mobile World Congress 2017, is compatible with the Galaxy S8 and Galaxy S8+ and other newer Galaxy phones. It is again designed by Oculus for mobile virtual reality apps and gaming. It comes with a dedicated, wireless controller, which features a one-handed, ergonomic design with a touchpad to restrict head movement and ensure a more comfortable experience. It also comes with two 42mm lenses with 101-degree field of view. However, price and release date for the new Gear VR are not yet known. If VR feels like the thing for you, then Sony has arguably the best offering on the market in its PS VR. Sure, you'll need to buy a PlayStation 4 to play it (or maybe a PS4 Pro) - but with some great deals on the PS4 Slim at the moment, the headset and console could cost you less than a Pixel XL phone would in the first place. Plus there's loads of exclusive Sony content.